100% Complete and Balanced Food for Adult Cats. As the makers of WHISKAS® we love cats for their independent spirits but understand they still need love and care that will nurture their curious spirit. 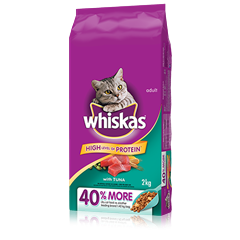 The crunchy kibble and pockets soft meaty centre of delicious pockets makes WHISKAS® food for cats the evolution of great tasting nutrition. Available in 2kg, 4kg, 9.1kg bags. 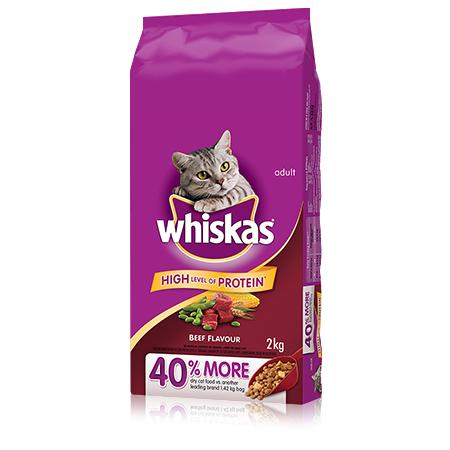 WHISKAS ® Beef Flavour Dry Food is rated 4.3 out of 5 by 68. Rated 5 out of 5 by BRELMB_3421142334 from Well i thought the package is well designed and the quality of the food inside appeared to be top notch. I know its cat food however we love feeding our cats quality food that they also like to eat and there was no exception here. They both got to try a small portion of this food and it was gone in seconds.We have since been buying whiskas ever since. All in all very happy with this product and the cats are too. Rated 5 out of 5 by COLLEENEPE_3421150377 from One cat in particular, thought it was the greatest food ever. If I fed them their regular food he would cry and rub the whiskas bag until I gave them some. They loved the treat like bits especially and were both excited to eat it. Seems like it really was a special treat for them. I was afraid changing foods might upset their tummies but there was no issue. Rated 4 out of 5 by ASHLEYPON_3421131877 from My cat liked this kibble fairly well. It isn't very different from the dry cat food she is used to, so she didn't mind. My cat ate it? But didn't go crazy over it. It's a typical lower price-point kibble, so the ingredients aren't amazing. If you are on a tight budget though, thus car food will certainly do in a pinch. Rated 4 out of 5 by NOELLAMNS_3421045824 from My cat is very fussy. He normally eats Whiskas Hairball Control and will not typically eat anything. He would eat Whiskas beef, although to be candid he did seem to prefer the Whiskas Hairball Control. 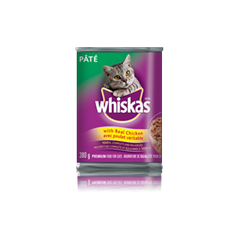 Rated 3 out of 5 by STEPHANIEVON_3421150204 from My cat is not very picky and will eat just about anything. He enjoyed this food very much. This food is reasonably priced compared to other cat food brands. I would purchase this food in the future. Rated 4 out of 5 by FABRICEDQC_3421048602 from cats seemed to like it very much. Although, i am a bit concerned about the quality of the items. Pet shops don't recommend it and i am not a professional on the subject so that's my only concern. WHISKAS® Beef Flavour Dry Food Formula is formulated to meet the nutritional levels established by the AAFCO Cat Food Nutrient Profiles for adult maintenance. * Individual requirements may differ from this guide. Please adjust quantity appropriately for your cat particularly when offering other foods including treats. WHISKAS® recommends that 2/3 of your cat’s daily calories come from wet food and 1/3 come from dry – don’t forget to treat your cat too!